We all love a clean, sparkling oven, but does anyone actually enjoy the cleaning process? Believe it or not, there are people who really enjoy maintaining their oven but there are also those who hate this task. Is it a job you put off, or do you secretly love it? Maybe you hope that someone else will do this for you? Cleaning the oven is undoubtedly a tedious task for most people, in fact, you can’t help but wonder mid-clean, why didn’t I do this sooner? You know you should’ve cleaned it two days ago, but you’ve been putting it off and now, it’s looking greasier than ever. Your dreading touching that burnt-black pizza cheese that oozed off last night’s pizza. The oil that bubbles away, on the bottom has formed a thick, stringy grease. If you attempt to put your oven on, your house will become smoky very quickly because of the burning oil. Not only is your oven unhygienic, it’s also a fire risk – that oil could catch fire. You’ve got no choice, you need to clean it, but you perish the thought of being up to your elbows scrubbing away the grime. I mean there should be a law against this kind of cleaning, right? What Are the Best Cleaning Products? Can I Use Natural Cleaning Products? 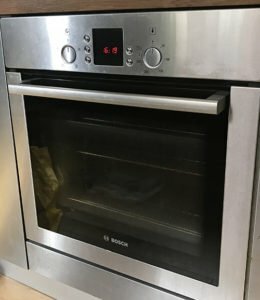 Can You Cook in an Oven After Cleaning It? If you tend to keep a clean oven and it isn’t too dirty, you can clean it really quickly, by using a cloth and warm, soapy, water. Wipe over the inside, removing any loose food. Take out the trays and soak them in the soapy water in the sink. Wipe the inside of the oven again and then soak your cloth. If there are some stains and grime, try using a Brillo Pad. This is also great for shining up your racks and removing any burned-on stains. As with anything, it’s best to rinse well with warm water before drying them. Dry them with a cloth and rub vigorously as this will help your racks to be extra shiny. Finally, clean your oven door by again using warm, soapy, water, and then dry with kitchen roll. Dry in a circular motion to avoid streaks. TOP TIP: Every time you use your oven, give it a quick wipe down with a damp cloth and warm, soapy water as this will prevent a build-up of grease and grime. This will obviously make the oven deep-clean much less tedious, in fact, it will become a lot easier. There are some common household hacks that can mean an easier clean for your oven, with minimal effort. Sometimes, it’s the thought of cleaning the oven that actually holds us back, rather than the difficulty. Having a plan and knowing in your mind that you are using an easy method, can motivate you to complete the clean rather leaving it until later. Making a Bicarbonate of Soda paste by mixing with water, is great to remove the stubborn stains so just paste it on. You should then put some white vinegar into a spray bottle and spray the paste. Watch as the paste reacts by frothing up. Leave this to work its magic for an hour or so before wiping clean and rinsing. The reaction does most of the demanding work for you, but there are occasions when you may need to use some of that elbow grease. However, this is minimal! 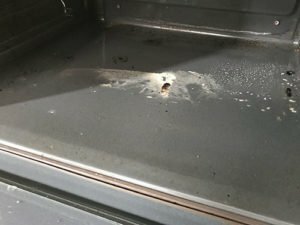 Steam cleaning your oven is also a good method, but it really depends on how dirty your oven is, as it won’t remove high-levels of built-up grease. This method is simple because all you have to do is place a bowl of hot water into a suitable bowl, inside the oven and bake for 30 minutes. After this time, don’t open the oven door, but leave the oven to cool with the moisture still inside. This will allow the dirt to be loosened and once it’s cool enough, wipe clean with a damp cloth. There’s nothing worse than when something drips off your food in the oven and welds itself to the bottom. Pizza cheese is something that regularly does this and if you don’t clean it, ASAP, the next time you to go to cook something, your oven will smell and become smoky. Step 1: Start off by removing everything from inside the oven, including the racks. Use a plastic or wooden spatula to scrape the bottom first, just to remove any excess food that isn’t completely ground on the oven’s bottom. Use kitchen roll to clean up the debris. Step 2: You then need some degreaser spray to spray your oven. 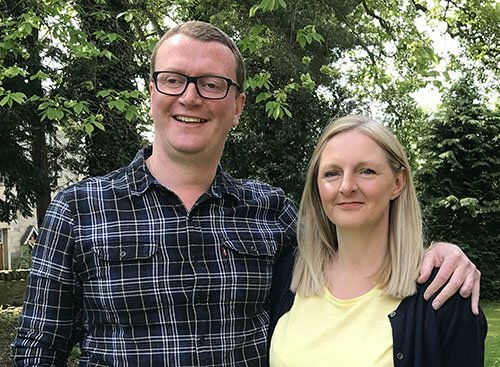 Brands like Mr Muscle and Flash have some great products for oven cleaning, or again, you might choose a more traditional approach and use the bicarbonate of soda paste and vinegar discussed earlier. Step 3: Leave your degreaser to do its work as instructed and then use a scouring pad to scrub away the oily stains. Afterwards, ensure you wipe your oven clean by using warm, soapy water and dry it with kitchen roll. If your oven has a self-cleaning option, this is great for baking off that welded on food at the bottom of your oven. Once the cycle has finished, simply leave it to cool and then wipe away the burnt food debris with paper towels before giving your oven a quick rub around with a damp cloth, or warm soapy water if necessary. Oven doors can a nightmare because they are very fiddly. Be careful that you don’t do anything to invalidate your warranty or insurance, for instance, there are often stipulations about taking apart the glass door. The rubber seal should also be kept intact, so be careful that you use a suitable cleaner that won’t affect the rubber and its effectiveness. The steel element of our door can be cleaned in the same way as the rest of your oven. The glass can be trickier. Use a multi-purpose cleaning spray at first and scrub away any grease and grime. Dry this with a paper towel. Some people prefer to use a glass cleaning spray on the outside of their door but ensure it’s safe to do so. Another alternative is white vinegar and tap water and then rubbing with paper towels. Try scrunching it up in a ball roughly to shine it up and remove streaks. If you still aren’t happy with the clean and can’t seem to get into every nook and cranny, then try using an old toothbrush, with a little of the bicarbonate soda paste on it. Scrub, but not too hard. Use the same process, spray with vinegar and then warm soapy water to finish the clean. The problem with oven racks is that food sticks to them and then gets burnt-on and ground in. They can be difficult to soak because they are often too big for the kitchen sink. The most viable way to clean your oven racks, is by soaking them, so you see the dilemma? You’re now thinking, how on earth can you soak your oven racks if they are too big for the sink? If you have a bath, then you should certainly try running your dirty oven racks a bubble bath. Soaking them in hot, soapy water for a while is perfect. Just leave them for around 30 minutes or so. Then take a scouring pad, or Brillo Pad and scrub them. This should remove any of the black or burnt, ground-in dirt. Don’t forget to rinse before shining them up with a clean, dry cloth. If the stains are particularly stubborn or you would rather not have to scrub, try using non-biological stain remover, Napisan. Just add a cap and soak your racks, but this time, leave them for around an hour. This should do all the hard work for you and remove those burnt-on stains. All you need to do is rinse well and shine them up, by drying them. There are so many cleaning products out there, so where do you even start when choosing products? Brands like Mr Muscle, Flash and Cif (previously Jif) have been popular for many years and are readily available in many stores and supermarkets at a reasonable price. The sheer volume of these branded products is huge, so again, choosing the right one is challenging and depends on what you are cleaning. They all offer suitable cleaning detergents for your oven but be careful as many intense oven cleaners contain a lot of chemicals and must be used in a well-ventilated area. 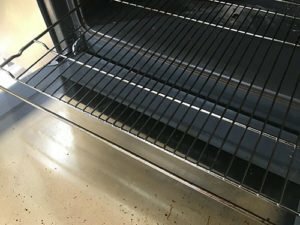 Sometimes, when cleaning our oven, we long for something else, something with that extra oomph, that will help us to achieve our gleaming oven mission. There are many other products with that extra edge available, that we don’t always see on the shelves in our favourite store. Napisan is fantastic for loosening any burnt-on food. It’s not too harsh and it’s not too expensive either. Just a single cap full can make your oven cleaning experience, so much simpler. HG Grease Away spray is also a great cleaner, removing those stubborn grimy and greasy stains. Brillo pads are great for scrubbing your oven and removing stains. The Dirtbusters Oven Cleaning kit is fantastic and it’s bio-degradable, making it all the more appealing. Of course, natural cleaning products can be used when cleaning your oven, and it’s possible that these natural products will be just as effective as any of the products you would buy in stores or supermarkets. There are some natural cleaning products you can make from household products, but of course, you must be cautious and ensure you are mixing natural products rather than chemicals. Try using the bicarbonate of soda paste discussed above, made from bicarbonate of soda and water. Just add a tablespoon of bicarbonate of soda, to 3-4 tablespoons of water and mix to a paste. This should be accompanied by a spray of white vinegar. Be careful on certain metals with white vinegar as it can cause rust and may need to be diluted. Always ensure that you rinse well too! Steam cleaning your oven is also great and that’s natural. 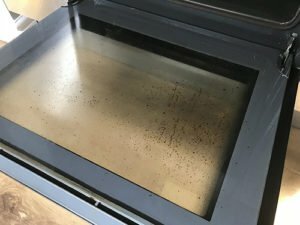 This is a simple way to clean your oven because your oven does the work for you; it’s very similar to self-cleaning and it’s completely chemical free. White vinegar (50%) and tap water (50%) mixed together in a spray bottle is an excellent, homemade and natural product for cleaning a glass or mirrored panels in your oven. Spritz your oven with the spray, then roughly scrunch up paper towels and rub dry in a circular movement. Get a clean scrunched paper towel and repeat to shine the glass/mirror up. There are some natural products that you can also buy if you shop around. Brands like , claim to be 100% plant-based products. You clean your oven with the sole intention of cooking again. You want a clean and hygienic oven to be able to do that safely. There are some precautions you should take to ensure your food isn’t affected by any of the cleaning detergents you use. When cleaning your oven, it’s best to wash all detergents away with warm, soapy water if you can, although some detergents simply require an excessive rinsing. The truth is, nobody wants their food smelling like their cleaning fluid and this can obviously be bad for you. Some cleaning fluids have quite a pungent smell or contain chemicals, so to be on the safe side, wash away the product and then rinse well with a damp cloth, before drying with a dry cloth or paper towels. Some cleaning detergents claim to be safe, so always read the manufacturer’s instructions, but if this is unclear, it’s best to wash away and rinse.